In conversation with Neha Sarai we explore the making of Valsan Koorma Kolleri the artist and try to fathom his message for society of today. In the process we can also try and discover what is it that art brings to society and what would be the role of the artist in the making and delivering these messages. Image: Laterite stone is a common traditional building material in Kerala and the West Coast of South India. Valsan has explored the textures and modularity of this building material to create installations that express his philosophy. Here combined with natural wood and a huge dry mushroom found somewhere in Kerala. This installation can be experienced from inside and outside. I am sharing the notes that I exchanged with Neha Sarai who is assembling content about the work of Valsan Koorma Kolleri the Artist and Valsan Koorma Kolleri the person for use in a new catalogue of his latest offerings. She has asked these questions to many people who know Valsan for many years and it will be interesting to see the overall picture that emerges when all the offerings are made available in an edited publication. My responses have been edited since I met Valsan in person at my office at NID on 10th January 2008 when we reviewed his web presence and discussed specific pieces. This gave me an opportunity to reflect on our long acquaintance that dates back over 30 years now. I could reflect on my first contact with him at NID in the 70’s and later in Madras over many visits and again at NID. This also gives me a window to look at the parallels in art and design and their respective roles in creating meaning in culture. Neha Sarai: What stands foremost and distinctive when you look at Valsan's art and thinks of Valsan as an artist? What is the element in the work of Valsan that compels attention? What is it that intrigues and fascinates you in the work of Valsan? Where would you place him as an artist? Prof. M P Ranjan: Artist is a commentator on the state of a society and on its sensitivity to current and traditional manifestations of materials, form and behaviour as a reflection on the unfolding of its culture that is being constantly transformed. These transformations are usually slow and unconsciously enacted but at times these are tumultuous and in the face and it is the artist who helps us and draws our attention to these changes through a statement that would help us juxtapose our own perceptions to the visible and tacit statements that can be felt in the work of the artist, if we care to look deeply and ponder on the intentions and actions behind the work. Valsan is a keen observer of our society in transformation and his work reflects his anguish and celebration of these changes as he manifests these flavours in material and form in his works that can be called sculpture since they are three dimensional and imbued with deep meaning. Neha Sarai: How do you perceive Valsan Kolleri’s work? Could one speak for instance of his work as series of multiple experiments with an idea over a period of thirty years? Prof. M P Ranjan: One of the striking themes of Valsan's work is the use of found materials in our society and here there is a bias towards that which is discarded in the course of our day to day living. He has stayed with this theme for many years since I first met him as a young student from Baroda in the mid-seventies. His interest in combining materials places him at an experimental plane and by drawing in found materials he has adopted challenges that require an innovative streak and a perception of possibilities in the discarded which have obviously by-passed the former user. Neha Sarai: Could one say he has chosen to work very quietly, almost silently? Yet, his contribution influence has been considerable. Also the ground upon which he seeks his stand is unusual. As a Sculptor who is aware of all that binds him to Modern times, his quest is to go back to roots beginnings, of life and earth. Sources towards which he turns for artistic energy are intensely subtle and mysterious: Earth and Nature. Would you agree? Or, would you see him as a desperate romantic unable to cope with the challenges of our time? Prof. M P Ranjan: Valsan is a realist in my view and a clear thinker of matters of deep concern at an ecological and human level. I recall an installation that he built while conducting a class at the National Institute of Design, which were made up of the long and winding strands of seed pods that had fallen of a tree at the NID campus. Having collected these fallen pods he proceeded to assemble a Taurus or great donut that was suspended and held in place by near invisible wires as the rotated and swayed gently in the breeze. These pods fall every year and it took Valsan's sharp insights to transform them into an ephemeral statement that still rings in my minds eye and I am sure in the minds of all those who had encountered these at NID. 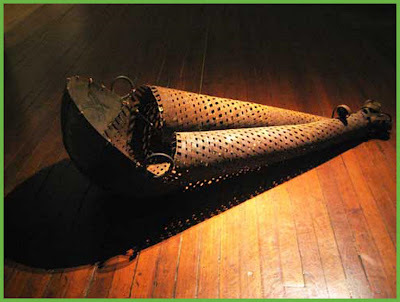 Neha Sarai: Valsan's chosen art form, to the extent one can give it a definite name could be said to be sculpture. But it seems to me that the art form sculpture as practised by Valsan embraces architecture, environment and the ritual of daily existence. What does this embracement signify? Is this embracement merely a case of juxtaposition, a kind of collage making, or does it acquire in his artwork a kind of inseparable unity? Prof. M P Ranjan: Yes, Valsan has a quiet political statement for society that is manifested in each of his works and these are clued in to the context of our times. Neha Sarai: What do the sculptures of Valsan signify for you? How does his persona as an artist relate to your understanding of his work? Where would you place him in the context of art today? Prof. M P Ranjan: He is a simple man in his actions and lifestyle with a complex mind and a sensitive bearing to social and ethical issues. He is a very fine craftsman who understands his materials deeply and one who is able to get these materials, some unconventional, to bend and meld to his wishes, in his mission inn making new meaning at a higher plane of discourse. Neha Sarai: As Sculptor, Valsan has sought to converse with architectural spaces. How do you see and respond to his Sakhathan experiment: the drainage series, earth diggings, placement-use of stone and other materials as if placed by and in Nature. Prof. M P Ranjan: I have not seen these in space so I will not comment on specific offerings. However the pictures of his large works in wire and in stone show a fine understanding of space and form and his value for the natural is evident in the treatment of the materials to show off its texture and material structure as an integral part of the work. Neha Sarai: How do you view Valsan’s obsessive concern to reuse-recycle waste and discarded materials? Do you think an artist should intervene and get involved in such situations? Could such an engagement contribute to art and artistic activity in a lasting authentic way? Prof. M P Ranjan: He is an artist who has a statement for both the social and an environmental domain. This is particularly significant in the world discovering of late the phenomenon of global warming which can be sensed in the messages that are inherent in Valsan’s work with recycled materials and with materials found in nature. Neha Sarai: How does the idea of reusing-recycling material discarded and thrown away find expression in the works of Valsan. How do you see and respond to his sense of aesthetics and art. How would you situate Valsan: as an Artist or as an Environmentalist? Prof. M P Ranjan: He is an artist who has located himself in a social and an environmental domain who uses his work to make a statement for society to appreciate. The environmentalist in him is not a visible trait. Image: Knotted copper wire is like a gossamer garment that is striking in scale and structure with an enticing texture through which one can see beyond. Neha Sarai: Knotted copper wirework has come to be seen as distinctively Valsan’s. Its endless knots go back to his early work. And yet, one can see in his copper wirework a new kind of intent at work: making specific forms to be read in many different ways. What does this kind of sculpture making signify? Prof. M P Ranjan: His copper filigree, if I can call it that, is the work of a master craftsman and a thinking artist. These are works that revel in the disclosure of structure with an element of surprise due to their scale and visual quality of its texture. The meta form is a product of the sub-structure and these are located in the knots and triangulations that are not geometric but a stability that is derived from a fine understanding of the principles of structure, very handcrafted and geodesic at heart. Neha Sarai: A thing can be shaped into forms almost without limit. One could say this kind of infinite possibility mimics the infinity in creation. Valsan’s Prakriti represents-restates the same idea in an entirely different language and material. Does that change-difference in language and material also lead to a difference-change of meaning. Prof. M P Ranjan: Valsan uses geometric order in many situations as well as form that can be seen as those derived from our culture and traditions. He is able to make a good blend of these to make a statement that is thought provoking. Neha Sarai: Works like Anima Animus could be seen as representing an idea of time. The same idea may be repeated in other forms. What could this kind of repetition signify? 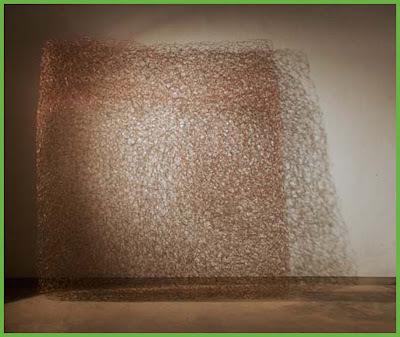 Prof. M P Ranjan: I have witnessed a phase in Valsan’s work where he explores the meaning of time through sculpture. “How Goes the Enemy” is one of these. When he was located in Madras in the 80’s he roamed the by-lanes of the city and in other places in the South for discarded grinding stones that became the basis for a series that combined metal castings with found stone. Neha Sarai: Valsan’s – How Goes the Enemy – is about time, its constant remaking and reliving. Do you think it also signifies possibilities of linking past and present, speed and timelessness? Neha Sarai: Consider for instance Valsan's exhibit the New Clear Age. The titles of his shows tend to invoke the play of more than one meaning in a word or phrase. Often, such play arises from similarity in the sound of words, differently meant and spelled. Do you see something similar at work in the choice of his materials and techniques? What would you say is the artistic intent and result of such play? Prof. M P Ranjan: Yes. The play of words is provocative and deliberate. Neha Sarai: Valsan likes to talk of healing, consolation or just the joy of touch. He has chosen to always keep a distance from political causes and agendas. Yet, his New Clear Age Series carries a sharp reminder that is unmistakeably political. What do you make of it? Prof. M P Ranjan: His work has always been political but in an understated manner. Neha Sarai: The geometry of space and its relationship with lived time seems a continual and critical preoccupation in the works of Valsan. Also, striking in this context is his passionate insistence that the artist remain true to the nature of the material used in a work of art. What are its implications for the idea and practise of art in the work of Valsan, and for art generally? Would such insistence be meaningful, for instance, in painting? Prof. M P Ranjan: Valsan shows an interest in geometry with a view to understand structure and form. However in his work, which is, hand made it is the organic that holds sway although the underlying structure may be geometric, just like it is in nature, which he tries to emulate. Neha Sarai: How would you decode Valsan’s use of materials? Is it purely contingent and Incidental? Does it resonate to a deeper purpose and rationale? Prof. M P Ranjan: It is obvious that the properties of materials hold a key to the way in which it is used in his work. Valsan looks for and enhances the unexpected attributes of material be it texture or structure in a very natural way. Neha Sarai: Valsan’s recent work is with the metal steel. Texture and qualities of this material are very different from metals and materials he has worked with earlier. Tough and unbending, it shines. How do you look upon his sculptures in steel? How does that work relate to his sculptures in bronze and laterite? Prof. M P Ranjan: I have not seen these. Neha Sarai: He has been moving towards organic shapes. Never puritanical in his choice of materials. Always inventive in his use of materials, be it plaster of Paris or bronze. He practices forms like Installation with great gusto. Many artists are doing installations. Does Valsan succeed in bringing to this practice some fresh insight or new dimension. At the same time he seeks to move towards organic shapes. Would you say that these apparent contraries provide a platform to debate art and globalisation? Prof. M P Ranjan: Yes, he does. Our art galleries are not yet able to respond to the need that art is a process of creation as well as an artefact that can be appreciated in space and time. The first requires the space to be turned into a studio while the second makes it a gallery in the traditional mould, which very few are able to combine in an integral offering. Future works of art may be therefore public performances with the involvement of the society in the making as well as in the appreciation. Valsan’s current efforts to build a space for this in Kerala in the form of the Shilpapaddiam centre would be interesting to watch as it unfolds in the days ahead. I look forward to the maturing of Valsan Koorma Kolleri’s art in this very public space. artists and activists alike seem to be the ones who hold a mirror to the rest of us in the world about where we stand and everyhting around us that we choose to not notice. but how far are they successful in getting us to move from our comfy couches and act on their messages, beyond appreciating them in galleries or discussing the issues at dinner. no matter how powerful and provocative their messages, so many of us so complacent about what we know to be sure doom, so does art or activism really have any effect beyond the ephemeral? Well I am posting my comment on the first comment. A negative connotation for a word school doesn’t imply. Schools exist only on positive and constructive goals. And the expectation from a school of thought need not be revolutionary, it is you and me who create them, so it doesn’t mean there is a ready answer with it. It subjects to trigger the next direction when we are really lost our ways and thoughts. So I believe the activism and art empirical leads and led us for a progressive outlook. Galleries and dinner tables are the real catalyst of metamorphism of our thought process.